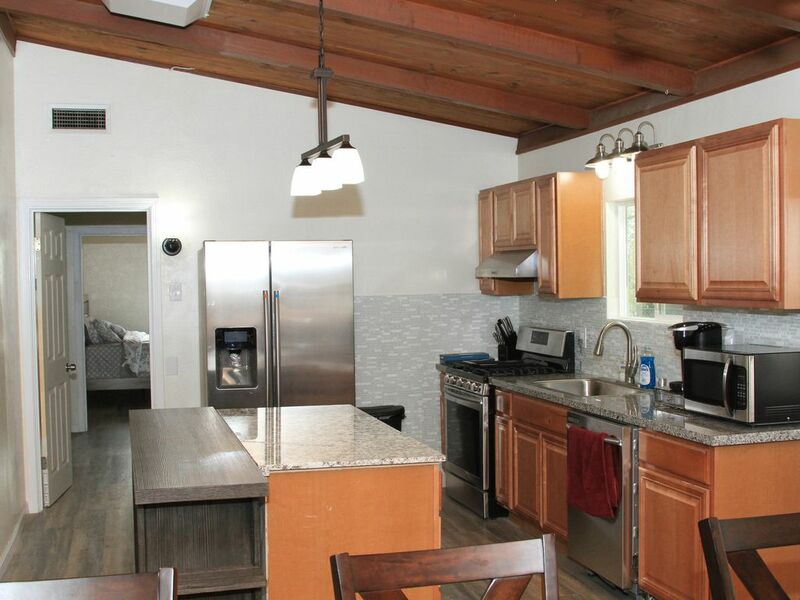 The lovely place is a spacious 3 bedroom, 2 full baths that has all the amenities. It is centrally located in Auburn. It is very near foresthill bridge and easy access to I-80 (less than a mile). About 2.5- 3 miles to oldtown and downtown Auburn. It is near hiking trails and about 3-4 miles to American Canyon. Explore the beauty of Auburn staying on this cool property that has huge front, side & backyard. The location of the house is on a culdesac, so lots of parking spaces. Will fit an RV or a boat. The home has been recently upgraded, however, it still has the charm and character that makes you feel at home. My place has an easy access to I-80. Minutes away from Auburn downtown, oldtown, American River Canyon. Minutes away from popular hiking and biking spots in Auburn. Quick access to the popular breweries and restaurants. The house is a 1,330 square ft and lot size is 13,000 sq ft. It is located on a culdesac, so lots of parking spaces, can even fit an RV or a boat on our side yard. The entire house was recently remodeled and upgraded. From furniture to appliances to utensils to towels and linens, everything was bought new. The master bedroom suite has a comfortable Plush Pillow Top KING size bed and a bathtub in the ensuite bath that has a rainfall showerhead. Master’s bedroom has backyard access. The two other bedrooms have a comfortable QUEEN size beds that has Plush 3 inches memory foam mattress topper and the other bathroom has a walk in shower, rainfall showerhead and a bidet. We have a sectional couch in the living room that can sleep 2 pax. We have a concrete patio and an outdoor grill as well as outdoor seating. The entire house is only on one level, no steps to enter. It has wide doorways and wide walkways. We have a 55 inch tv in the living room, 43 inches Smart TV in all 3 bedrooms, dvd/bluray in the living room, and we have very fast wifi, so you can enjoy watching netflix, etc. We have lots of board games/puzzles. Our front yard and back yard has trees that makes summer cooler. It is located in a very quiet and very friendly neighborhood. Close to restaurants, fast food and supermarket. The place is near the freeway. Also very near Machado’s, Ikeda’s, restaurants and supermarket. Centrally located in Auburn. Less than a mile from I-80, about a mile to 1.5 miles to foresthill bridge. Supermarket such as Raley’s about 1.5miles. Restaurants such as Maria’s Mexican Tacos about 0.3 miles, Beach hut deli about 0.3 miles, Sweetpeas breakfast about 0.5miles, lots of nearby restaurants, gasoline stations and fastfood. I am always available to our guests either by text, email or phone call. If I don’t answer, I usually get back to you right away. Just let us know if you need anything. We try to accomodate our guest as much as we can so they can have the best experience while staying at our lovely home. Hello, My name is Joy. I’ve been living in Auburn for the past 13 years and I am loving it. I love Auburn so much that I decided to have a vacation rental home so as to share the beauty of Auburn to anyone wanting to explore it. People are very friendly, community, very safe. I have two beautiful kids that I love raising here. I hope you get to enjoy our place and Auburn as we enjoy it. This property is located on a culdesac and has a huge lot. I loved it because it is on a great location, very close to restaurants and hiking spots in Auburn. It is also a one story home and great for people who are having a hard time going up/down stairs. It is also located on a very friendly and very quiet neighborhood. Kitchen has stainless steel refrigerator, stove top, oven, sink, microwave. We also have the utensils and cookware that our guests can use. Second stay at Joy's property. Really enjoy how Centrally located the property is and plenty of room. The beds are very comfy.Well stocked kitchen, washer and dryer, all the comforts of home. Nice yard to enjoy outdoors. Highly recommend for a stay in the Auburn area. Joy is very good with communication which is a plus. Our family enjoyed Joy’s home. It was very spacious, clean, and welcoming. This home in Auburn was nice to stay at. Our family of seven had plenty of room to sleep and hang out. Lots of games, well stocked kitchen, nice bathrooms, and the back yard looked inviting. We unfortunately had to check out early for there was a power outage our second day there. We were going to a wedding and didn’t want to come home to a dark cold house especially with a small baby. Joy was very understanding and was easy to work with. She refunded two of the nights stay. We so appreciated her. The only thing I would suggest is a few more towels and blankets. It was unusually cold the day we were there. We would definitely recommend staying here if in the Auburn area. This house has been totally remodeled and is fabulous. Kitchen is well stocked and the owner is extremely easy to work with. Front and back patios with seating to enjoy the nicely manicured yard. Wish this owner had places all over the world so we could stay in them! Joy was so easy to work with and loved all the nice touches. There was a nice bottle of wine with a hand written card welcoming us. You could reach out to her with text if you had any questions at all and she responded ASAP. We are looking forward to staying there again. This place is a happy home that has what you need. Enjoyed having separate bedroom areas with each well equipped and cozy for all. The kitchen made cooking fun - well stocked - I would definitely stay here again.